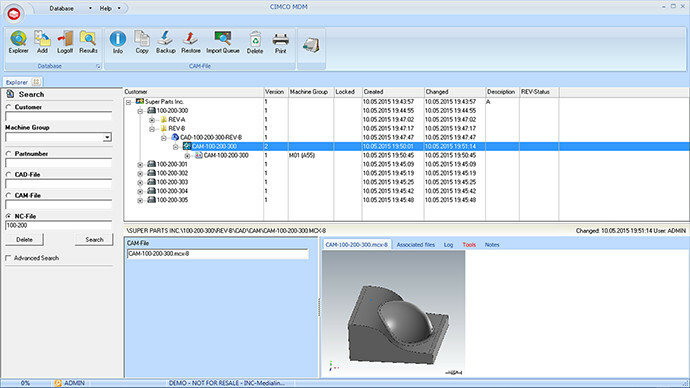 Manufacturing companies often need to manage large amounts of documents such as CAD/CAM files, NC programs, setup sheets, tool lists, and QA documents. Not having all of these documents securely stored, organized, and made accessible this can lead to wasted time, decreased production, and costly mistakes. CIMCO MDM provides all the functionality you would expect from a modern information management system, and then some. MDM lets you collect and structure all of your manufacturing related documents on a central server and provides options for handling file/folder restrictions, user permissions, automated processes, backup/restore, and version control. CIMCO MDM can integrate with all of your existing software applications and machines. It provides a central hub for managing and controlling all of your manufacturing related data, for accessing your applications, and helps ensure that authorized employees and machines get access to the right information efficiently.